Spring is on it’s way! Finally the island is starting to thaw and we couldn’t be happier or more ready for a little warmth. It’s the perfect time of year for hiking before the temperatures start to soar in the coming months. One of our favourite springtime hikes is the circular route from Cala Estreta near Arta in the northeast. This track gives you the benefit of both mountain and jaw dropping coastal views, and you can often even see Menorca in the distance. 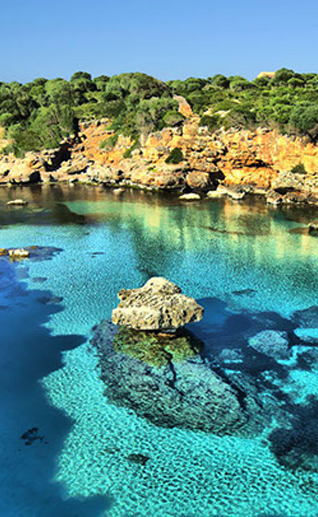 Stop for a picnic at one of the deserted coves or white sand beaches along the path, then carry on past the 16th century watch tower, Torre d’Albarca, and continue along the coast back to the beginning. The whole trek is about 9km and takes around 3.5 hours start to finish. For more family fun that will get the body moving try the new Family Class at Choi Kwang Do Mallorca every Saturday morning from 9 March. Choi Kwang Do is the increasingly popular martial art suitable for young and old – a wonderful way to bond with your child with a common goal and interest. As an added bonus all Nourish subscribers will get their first taster class for free, as well as a full dobok (suit) for free! Book your place by emailing info@ckdmallorca.com. After all that movement and blood pumping perhaps some more restorative activities are in order. to the effectiveness of the Grinberg Method as a means of transformation and healing. Feel the shift as you let go off old patterns and trauma somatised in the body. We highly recommend experiencing one of her beautifully therapeutic massages too! If chronic pain is something you’ve been dealing with then let us introduce you to Petro Kohut, certified Rolfer at Lucky Bodies and Happy Souls. The practice of Rolfing is a holistic system of bodywork, manipulating the soft tissue (muscles and fascia), and inviting and awakening new movement capacities to effectively realign the body’s structure. Rolfing releases and balances tensions, freeing up the body’s energy to heal effectively. After experiencing rolfing from Petro first hand we can attest to its extraordinary results! If you’re looking for a relaxing getaway not too far from home then we have the perfect on-island escape for you at Fontsanta Hotel – Thermal Spa and Wellness. Experience their 1-night ‘Special Spring Detox’, which includes a superior terrace double room, breakfast buffet, yoga class, healthy menu (including drinks), access to the thermal circuit (Fontsanta boasts the Balearics only thermal waters), rental car, plus 20% off all spa treatments! Running until 16 April this deal is only €187 per person (minimum 2 people, VAT included). We’ll see you there! Contact info@fontsantahotel.com for more information.